Want to study a Master’s in Risk Management? Our distance learning MSc Organisation Risk Management course allows you to earn and learn at the same time. You will be provided with practical problem solving skills as well as a deep theoretical knowledge of the risk environment, making you highly desirable in the job market. The course is taught entirely online allowing you to tailor your study hours around your lifestyle. You will also find a tutor available as required to provide additional support. You will be encouraged to use your own experiences to apply techniques and develop solutions to issues, thereby offering immediate benefit to your work environment. The course closely aligns to the Institute of Risk Managers International Diploma in Risk Management and we are seeking exemptions from their examinations. We are an established team with over 20 years’ experience of delivering risk based courses. The Distance Learning route is delivered entirely off campus, the only attendance requirement being for examinations. The lecture team has a long history of running distance learning courses, using appropriate communication methods to ensure a sense of belonging is developed. 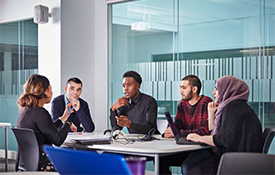 Though this is a Distance Learning course, students are more than welcome to come to Birmingham City University and take advantage of all of our facilities to aid in their learning. To register for the Master's degree, you should normally hold a recognised Bachelor's degree of a good standard. Applicants with suitable work experience and/or qualifications other than those above may be considered for entry. Whilst membership of the IRM is not a requirement of the course, it is highly recommended. Details of their membership fees and certification fees can be found here. If you study this course part-time, you will be charged on a pro-rata basis. This module will explore the various sources and types of risk information that allow the identification and detection of risks. It will examine different techniques available for identifying risks, both opportunities and threats, and will explore methods for analysing risks and uncertainties from a qualitative and quantitative perspective. This module now focuses on the leadership of risk within an organisation. It considers the activities of the Board, its’ committee, the Executive and the senior management team in developing the risk management strategy, appetite and culture for the organisation. It will also consider business ethics and corporate social responsibility and their influence over the risk management of an organisation. This module aims to develop the student by encouraging them to identify the strategies that can be used to avoid future risk by increasing the resilience of operations, thereby enhancing the students knowledge and ability in the area of Risk Management. As this is a research project of the students’ choice in the area of risk management, any of the Programme learning outcomes can apply depending on the area that the student has chosen. It will be the responsibility of the student and their allocated mentor to identify which Programme learning outcomes relate to the research project. This course is offered as a distance learning course, enabling you to study at a time that suits you. You don’t have to attend any face-to-face sessions, and delivery of course materials is done through our e-learning platform, Moodle. Each module has a revision day which, although not mandatory, you should highly consider attending. If you can’t make it, supporting materials are made available via email. Further study opportunities are available on the Business School's PhD Programme and we welcome applications from these interested in undertaking study in the Centre's core areas of interest. All assignments are grounded in real working organisations, allowing you to apply your knowledge into a real working environment. The majority of students enrolling on this course will already be in employment, although not necessarily in the area of risk management. You will be encouraged to use your own organisations in the consideration of topic areas, thus increasing your profile within that organisation. Should this prove difficult, the team has a strong track record of working with individual students to provide case studies and / or internships. Many of our students are already employed and are sponsored through their study, so that on their return they can set up a risk management function or apply the concepts to their existing department. Typical organisations that they come from include local authorities, the health sector, central government and government agencies, and financial services. Many of our students work in risk management or a similar role.